Smart goals measure the most engaged visits to your website and automatically turn those visits into Goals, even if you don’t have conversion or ecommerce tracking. Then use those Goals to improve your AdWords bidding. This article will explain exactly what smart goals are and how to use this feature. Smart goals are recommended to be used when you aren’t measuring conversions. Smart Goals is an easy way to use your best sessions as conversions. You can then use Smart Goals to optimize your AdWords performance based on the ‘best sessions’ pattern. To determine the best sessions, Smart Goals establishes a threshold by selecting approximately the top 5% of the traffic to your site coming from AdWords. Once that threshold is set, Smart Goals applies it to all your website sessions, including traffic from channels other than AdWords. After enabling Smart Goals in Analytics, they can be imported into AdWords. Select Smart Goal (if available). 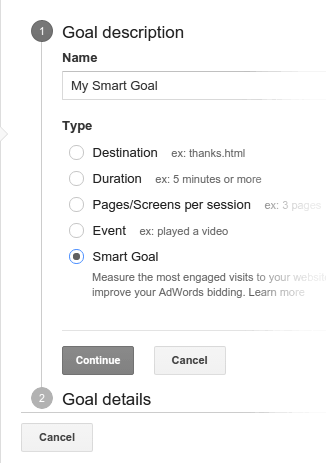 Give your Smart Goal a name and click Save. After you’ve activated Smart Goals in Analytics, sign in to your AdWords account, click the Tools tab, and select Conversions. Click Analytics in the left-hand menu. Check the boxes next to the goals or transactions you want to import. Click Continue. On the next page, you’ll see settings that will apply to all of the goals or transactions you selected. Make your choices, then click Import goals. AdWords will begin importing the data from your Analytics account. Historical data from before the import won’t be included. To help you see how Smart Goals perform, use the Conversions > Goals > Smart Goals report. This report shows you how your Smart Goals traffic differs from other traffic. You can also include the Smart Goals Completed dimension in custom reports. The Smart Goals report shows you how Smart Goals would perform even before enabling them in your view (assuming you are eligible to use Smart Goals in the first place). This lets you determine if Smart Goals will be of benefit to you before going through all the steps above. Both the Smart Goals report and the Smart Goals Completed dimension are only available in views which are eligible for Smart Goals. Interested in getting help with any of these features? Littledata’s enterprise plans include support for a dedicated account manager.